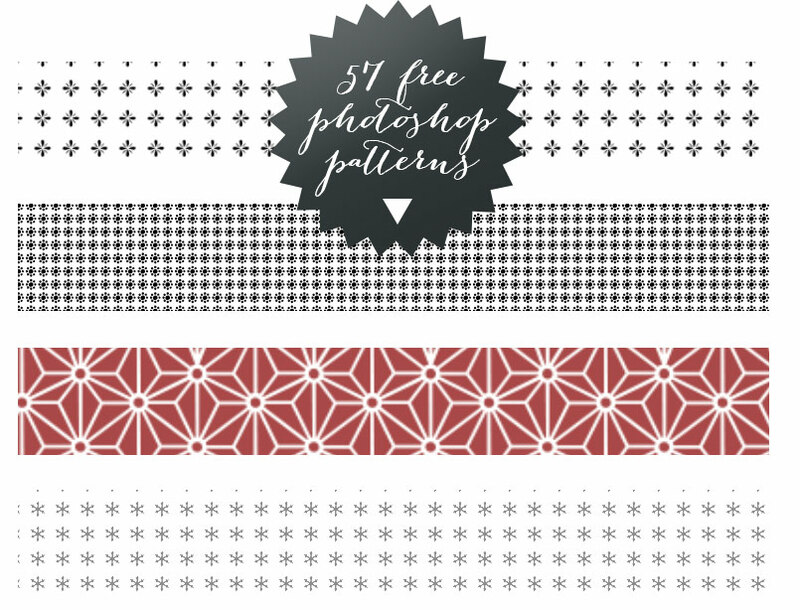 Looking for free patterns for Photoshop? I designed these patterns and created an export of the patterns palette that can be used in Photoshop. It's in a single file that can be imported for immediate use. These patterns are seamless (ie. repeating) so they can be applied to any shape or space and fill them perfectly. The patterns are high resolution so they can be used for print work. Test them out on your printer to see first. I've sized them down very small for the preview graphic. The file is a .PAT file. 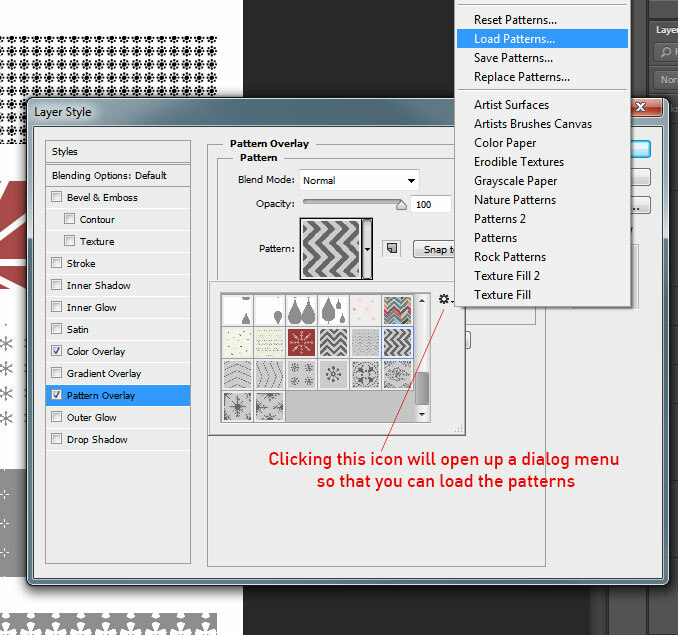 You can install the patterns palette by double-clicking the file, or you can import it into your overall patterns palette by clicking the small icon when you're inside the layer options menu. See graphic below. There are popular patterns in this including chevron patterns, heart patterns, snowflakes, stars and more. Here's an example graphic showing every pattern. I didn't want to put it in this post as the file is 1.5MB. To download sign up for my newsletter and the link will be sent to you. Sorry, I’m feeling a little dense…I don’t see where/how to download the freebie….? Thanks and these look great! Hi Jeff, I don’t see the links for facebook or google+ active and after tweeting one of your other offers, the freebie link didn’t appear. It seems you send an e-mail? Hi Steve, sorry for the late response. Sometimes when the plugin to unlock these files needs updating the buttons disappear. I’ve updated the plugin so now I can see the unlock options. Try it again if you’re still interested. Thanks. Thank you for the download. I was able to get the file downloaded, but it downloaded a .zip file and I don’t have an option to unzip the files. Photoshop won’t allow me to upload the new styles in their current format. Any tips on how to reformat them? Hi Ashley, not sure if you’re on a mac or PC, but I would google free unzip software. I use winrar but you could also use 7zip if on a PC. I can’t get the social media links to do anything so I can’t unlock the designs. I would really love to have them if they are still available. Thanks! Hi Tanya, sorry about that. Many people were having problems with the unlocking of the download link when you like me on Facebook so I’ve changed the way you can download the patterns by subscribing to my newsletter. I’ve updated this post so all you have to do is subscribe and the download links will arrive in an hour after you subscribe. I don’t see anywhere to download these or anything else either. Trying to download numerous things here. Hi Scott, you need to subscribe to the newsletter to receive the email with all the download links. There’s a subscribe form at the end of this post. Not sure why you are not seeing it. Can you try from another browser? Hi Scott, I see you received the email fine and clicked some of the links. Hope everything works out for you. Hey Jeff – I subscribed yesterday but haven’t received a download link. Are you able to help? Hi Steve, I’ve sent you an email. Hi Wendy, check your spam folder… or do a quick search in gmail for Hendrickson and you should find it. Check your spam folder Iwona, or do a quick search in gmail. I have subscribed and confirmed my email but I never receive a download link. I even tried my personal email to see if it would work but still nothing. Am I doing something wrong? I am so thankful to find such a good freebie! Hi @Amanda, I see you are subscribed and one email has been sent. Did you receive it ok? If not do a search in gmail for Hendrickson and it should pop up. If not, let me know. Thanks! I subscribed today but haven’t received a download link. Are you able to help? I show you are subscribed Cath… please do a quick search in gmail for Hendrickson and you should find it. Thanks. Carolyn, please check your spam folder or do a search for Hendrickson. You should find it. I tweeted but dont see the download link? Hi Lyn, I’ve fixed the issue. You just need to sign up to the newsletter to get the download link for the Free Patterns.